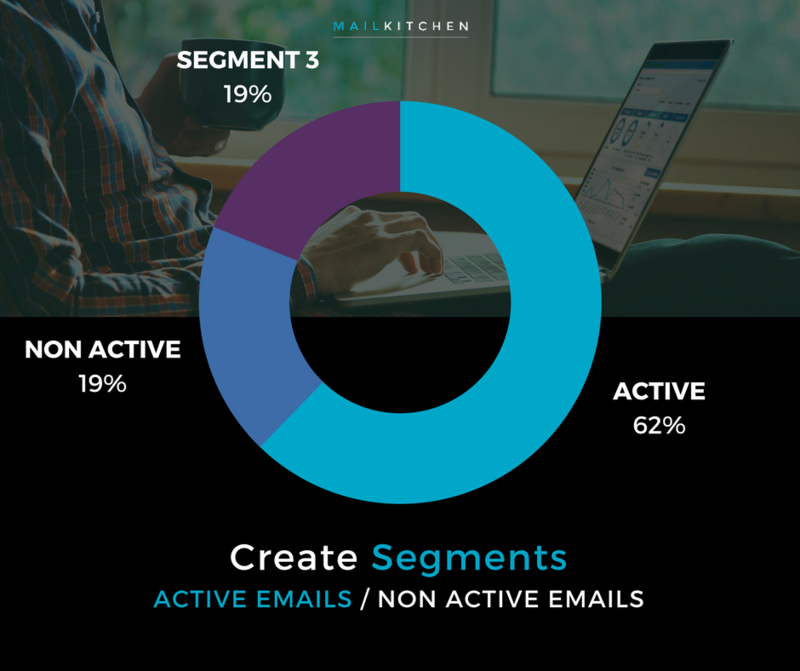 To learn more about email marketing segmentation, when, how and why to use it, read our article Segmentation: how to segment your email database . We added new criteria that allow you to push even further the segmenting of your email database and to create segments based on the activity or the reactivity of your email recipients. Once logged into your account click on the tab SUBSCRIBERS DATABASE in the top menu of the page and then on the link All My Contacts. Then click the button My Segments. The main advantages of these new options added to our Segmentation tool concern the possibility of creating highly targeted segments based on the activity or the behavior of your contacts. You can create different segments, using the date of the last activity (open / click) and exclude or isolate the non-active recipients. Example: Imagine you sent a campaign to inform your recipients of an event you are organizing. To ensure that the email reaches the maximum number of recipients, you can decide to send the same campaign only to non-openers some days later. You will therefore need to create a segment with the criterion LAST OPENED EMAIL (DATE) and send again your campaign by excluding the segment you just created. Your new campaign will be sent only to non-openers of the previous email campaign. Once the segment is created, it will be updated automatically each time you’ll use it to send an email campaign. You don’t need to create a new segment every time you decide to send a new email campaign. Example: If you create a segment of recipients that opened an email in the last 30 days, the software will automatically calculate the openers applying the criterion of 30 days. The software will take into account the date when you’re sending your email campaign and subtract 30 days. No other manipulation or action on your part will be required. The segmentation module allows you to create new mailing lists directly from your account. No need to export all or a part of your database for processing it with Excel and then importing it back into your account. By using the predefined segmentation criteria and / or custom fields that you created and imported in your lists, you can generate a new list (a new segment) in just a few clicks. Example: Imagine that you have two mailing lists that you update regularly: Customers and Prospects. You want to send a special offer but only to your Prospects and only to the contacts you recently inserted in your Mailing list and that have never received an email campaign. You’ll need to create a segment with the MAILING LIST criterion (indicating the name of the list) and a second criterion NUMBER OF SENT EMAILS (indicating “empty”) and you will therefore create a segment containing only the email addresses of your Prospects that you have never used before. You don’t have to export and re-import a new list, you can manage everything automatically directly from your account. In this way, you can create a segment of all users who open an email in the last 30 days.